Batterytests - Sähköautot - Nyt! We have build an Open Source battery testing station to Tampere Electric Vehicle Center (TEVC). Station is housed in old half-size sea container, so we can control the ambient temperature if needed. We have currently ability to test batteries ranging roughly from 40-320 volts, with various amounts of charging-power available. We can cool batteries down to -18 Celcius (0 F) with quite large freezer. We can test and measure different BMS-systems and see how they work. We are currently building automated single cell charge and discharge ability, for now just 2 independed cells simultaneously. Hopefully more in the future. 2 x independed single cell automated cycle stations with 1.5 kW charge capacity and about 80A discharge capacity. We are using these to examine individual cells and possibly to automate internal resistance measurements. All the measurements are inserted to common database that can handle multiple simultaneous devices sending measurements. Every measurement is accessible with just normal web-browser, including browsers found in popular cell-phones. 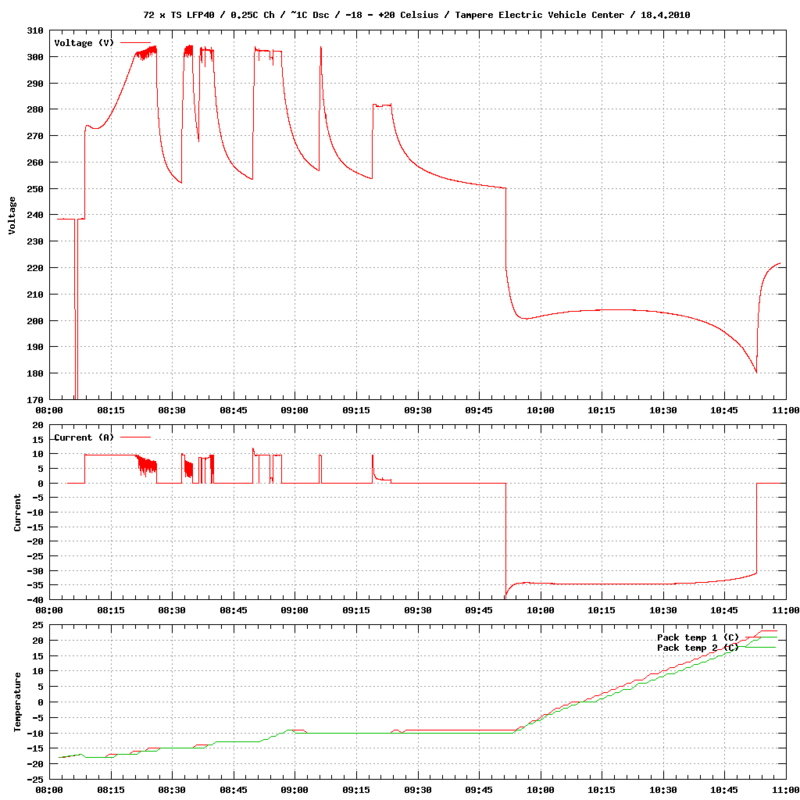 This was our first measurement and as such, it contains unnecessary spikes and power applied to the battery due to testing and tuning of charge-control. 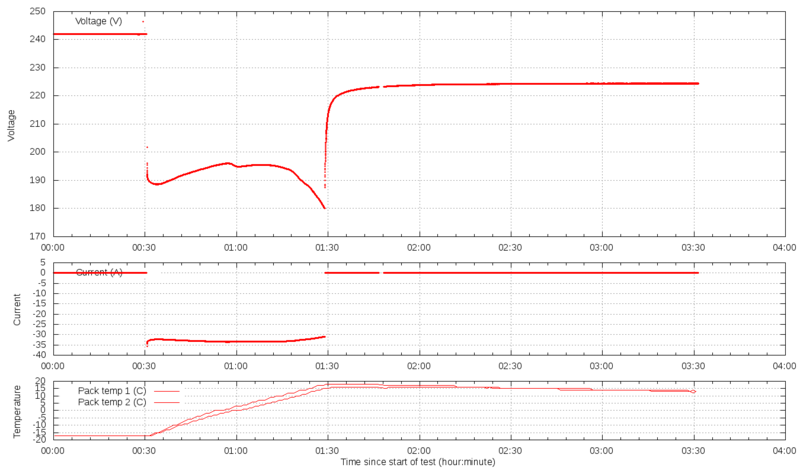 Voltage went up when discharged when battery was below 0 C (32 F). In normal situation voltage drops when battery is discharged. When battery was about 0 C (32 F), voltage started to drop. When charge ended, voltage dropped very fast. Voltage drop was about 0.8V / cell. The custom-made BMS we tested, was working fine in low-temperatures. Battery was charged about two days before discharge so that both voltage and temperature were at constant level before discharge started. Discharge was ended when battery voltage was 180 V.